“I started in the office 25 years ago, in the old building across the interstate, and if I didn’t enjoy my time here, I would have left 23 years ago” This quote from Long Haul employee, Dave Fiecke, talks a lot about one of the most loved things at LHT, a family atmosphere. 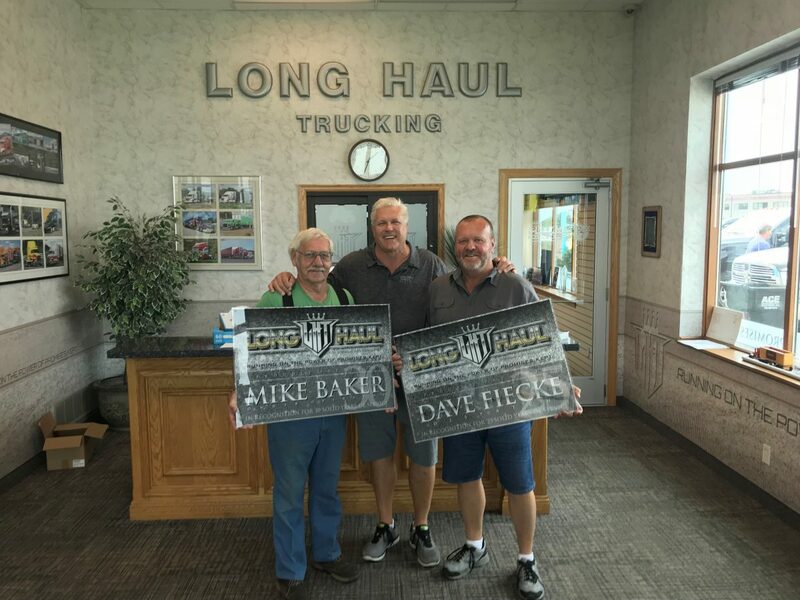 This month, Long Haul Trucking is celebrating two great milestones as Dave celebrates his 25-year anniversary of working in the office, while our first owner operator, Mike Baker, celebrates 30 years of driving with the Long-Haul name on the side of his truck. Both guys are not only highly valued teammates, but figures of professionalism, reliability and friendliness that helped shape and maintain Long Haul’s elite reputation throughout the years. Dave started at Long Haul in 1991, when he leased his truck on as an owner operator, “I was the 19th driver to join the fleet.” From the start of his career as a driver, Dave constantly left a first-class impression on every customer and driver he met, eventually deciding to transfer out of the truck and get behind the desk as one of our best dispatchers. “It’s been amazing to watch the company grow from 19 trucks to 360, and I am proud to be a part of that.” Dave has certainly seen a great amount of growth at the company through his tenure at LHT, sharing in many of the great memories, and growing pains that come with the evolution of a company. These days, it’s hard to find anyone that’s worked with, or for LHT, that doesn’t know who Dave is. Working as one of our dispatch leads for Minnesota outbound, while facilitating and maintaining great relationships with both our drivers and customers is part of what makes him valuable resource. Not only is he a dependable, hardworking and a successful employee, but one of the nicest and easy-going employees in the office. “We learned from John how to run a trucking company the right way, and now that we’re growing, it’s important to pass on those lessons to the younger people joining the team.” Thank you, Dave, for being the great person you are, and staying on our team for all these years! Along with Dave’s accomplishment in his years of service, we also salute Mike Baker, who this month celebrates his 30-year anniversary with the company. Mike is everything that we could ever ask for in a teammate and an owner operator. He is polite, courteous, intelligent and always willing to share some insight on what’s made his tenure with LHT such a success. “I started 30 years ago, and at that time we were still working out of JD’s town house in Maple Grove.” It’s amazing to consider the growth that Mike has witnessed over the years, from working out of JD’s town house, moving to a new building, then upgrading again to current LHT headquarters and witnessing numerous expansions, he has not only been a staple of our fleet but significant in keeping the business on course to promote our growth. “It’s all about treating it (driving) like a business, watch your P’s and Q’s, and always remember that it’s feast or famine, a short walk from the penthouse to the outhouse in this industry.” With maintaining a professional and committed mentality for his craft, Mike has been able to enjoy 30 successful years with our team and we couldn’t be prouder to have him on board. Mike Baker and Dave Fiecke are two employees that play a significant role in Long Haul’s past, present and future. As a company, we couldn’t be happier with the work that they’ve done and all the positive contributions they’ve made both in the office and out on the road. Thank you, Mike and Dave, for all that you do, you are true Long Haul Legends!